Here is our journal and some pictures from our stars at the shows. What a final show Chief had! They always say the 3rd Grand Certificate is the hardest to get and boy has that been true for our males. Yuri sadly is sitting on 2 GCs and 3 Reserves. We thought we might be heading down the same path with Chief. Thank goodness that wasn't the case. 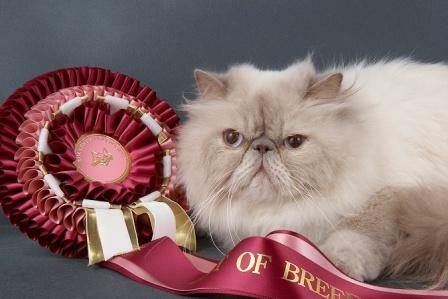 He was looking great with a nice full Autumn coat and won his 3rd Grand Certificate, Best of Breed, Best Persain Adult and Best In Show Persian. Now that's what I call a good end to a show career! His daughter Mischief Molly was also there. She's the daughter of Chief and Holly hence her name. We were trying to be clever. She also had a great day on her first day at a show with a Red Card Day winning her open class, Best of Breed and all her misc classes. She wasn't all that pleased to be there at the beginning but with a few more outings I'm sure she'll begin to love it. What a final show Millie had! She missed 3 shows in January/February due to a cut on her foot from too much partying at Christmas. It took 2 months for the fur to grow back and we immediately hit the show scene again in March. Then of course she started cycling and we never thought we would achieve a Champion title but thanks to the judges at this show she was awarded her 3rd CC making her a Champion. 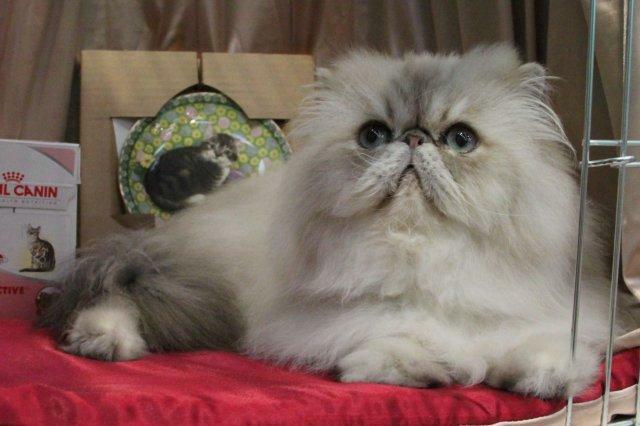 Even more to our surprise she went on to win Best in Show Persian Adult. What an achievement for the beautiful daughter of our Sandypaws' boy Chief. Thank you to all the judges and their wonderful comments on the day. We have had a tough winter and ended up taking a break from the shows. 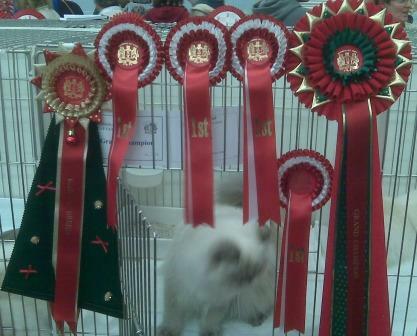 This was our 2nd show with Millie going for her Champion title. She won a 2nd CC and is almost a champ. Let's just hope we get there before she drops her coat with spring shedding closing in on her. I know we're not the only ones suffering with coats dropping all over the house. Good Luck to Millie and the other breeders in the coming weeks. This was our last show for 2010. This show was at a later date than last year and we barely sqweak in our entry. We brought along Chief and his daughter, Millie, who was 9 months on the day. Millie was awarded her first adult CC. We are very pleased how well she is devloping but then again she has Champion parents and our hopes are very high for her show success. Chief was up against 5 including 2 already Grand Champions which he lost to. Oh well better luck at the next show. We hope to get his GR CH title some time in 2011. Year #3 at this show. Yuri was here for the 3rd time along with two of Chief's daughters. We didn't have high hopes for the show and were pleasantly surprised with how well the cats did. Cheif's girls, Millie and DD, both received a 1st for their Open Class then DD went on to beat her big sister for Best of Breed. DD is such a cutie and was loved by all. I'm sure her age of just 16 weeks helped with the cute factor. Millie will be an adult at her next show so we're hoping she continues to do well. I've included some pictures of the girls below. Yuri received another Grand Reserve. He was beaten by a very good looking flame point boy with a really good coat. Poor Yuri doesn't seem to want to grow his winter coat and with all the other males in full coat he didn't do too badly. We need to decide now if we continue on our quest for the 3rd and elusive GC or retire him. My first time at this show and I loved it! It's so nice to go to a show with so many colourpoints. Of course the 3+ hour drive wasn't exactly fun (all by myself) but it was worth it. Chief was going for his 2nd Grand and another of his daughters, Dream Diva whose just 17 weeks, were at the show. Chief was awarded his 2nd Grand Certificate! The judge wrote in her comments "I love this lad to bits!" What great comments and thanks to the judge for this award. DD won her open kitten category and was also awarded the Best of Breed amongst the kittens. Shockingly there were mostly tabby points at the show. 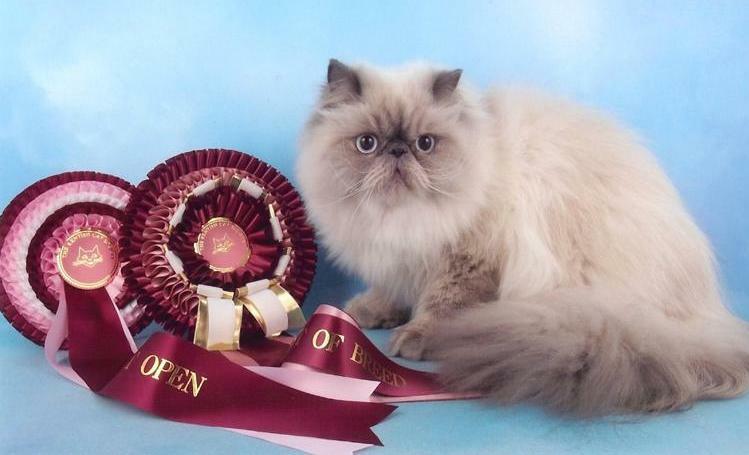 Then the excitement began when Chief was awarded Best of Variety Persian. He was then judged against the other BOV winners and didn't get the final award but hey at least he was in with a chance. What a good show. I'll be sure to put this on my list as one not to be missed. This is our 3rd time going to this show. It doesn't seem like we've been showing very long but the show halls are all becoming familiar as are the people. It's nice to know you'll be seeing the other breeders and judges who are fast our becoming friends. The days can be very long but now we're able to pass the time catching up and finding out what's new with their cats and breeding programs. It makes the very long days go by just a little bit faster. Chief was at his first show as Champion competing for his Grand. He now needs to get 3 GCs before he can gain the next title. It's going to be a very long show season and we hope he makes it. Today he received his 1st Grand Certificate so we're one step closer. He still hasn't put on his full winter coat so we were very pleased. Again thanks to the judge who started him on his way. Chief was going for his 3rd and final CC to become Champion today. It's not exactly the best time of year to be showing as the cats have been shedding for the past 3 months, especially the older adults including Chief. We were very happy however for him to be awarded a CC which makes him a Double Champion with ttiles in the GCCF and with the CFA. Congrats to Chief and thanks to the judge who gave him his final CC. We've been wanting to check out the TICA shows for some time. We had been told they are similar to the CFA shows and we hope to show back in the states some day. Holly is already registered with TICA so she was the obvious choice. Registration was extremely easy being an on-line system. Then we set out to buy curtains for the cage which we found out later were completely unnecessary. Then it was a matter of waiting for show date and getting Holly ready. Of course she decides to begin calling and calls constantly for 2 weeks up until the date of the show. She rips out half her mane around her neck and is only half the cat she was a month earlier from not eating. Not exactly filling me with any confidence we would win anything on the day. Upon arrival people made me feel comfortable right away. I'm sure it was the very lost look on my face that gave everyone the inkling that I was a newbie. After settling Holly in I was walked through the show schedule and what I needed to do when our number was called for various rings. There were 6 rings where she would be judged throughout the day. TICA is very different to GCCF and titles are based on points and finals achieved in the rings. Holly needed 300 points and 1 final for a Champion title. At the first few rings she didn't know what was up and was quite temperamental. By the 5th and 6th ring she had become accustomed to being handled by strangers. (Now that we know what is expected we'll work with the cats prior to going to any more shows.) It took all day but finally around 4 0'clock she was called for a final. She placed 6th overall adult which is quite an achievement. With that and the number of points received she is now a TICA Champion. She's our first Double Champion. Thanks goes out to the US judge from New Orleans who placed her in his final. When we decided to enter this show we thought it would be fun to take a 3 hour drive up North and see some of the country. Little did we know we would be driving through pouring rain in miserable cold weather. However, it was well worth the drive. Holly was awarded BOB and her 3rd CC which makes her an offical GCCF Champion. She missed a red card day again by 1 second place finish but that certainly didn't dampen our spirits. Congrats to Holly our 2nd 3 show Champion. Thank you to all the judges that made this possible! Chief was at the show receiving a 1st for his open and his 2nd CC. It is amazing the number of people that come up to admire him. He loves being at the show and spends the day at the front of his cage watching everything that goes on. Holly had her 2nd day out at the shows. We were pleased to see so many friends at the show. It makes the day a lot more interesting when you have your friend's cats to cheer on as well as your own. Holly won her open and received her 2nd CC. She has just one more show to go for her Champion title in just a few weeks time. This year is hopefully going to be Holly's time to shine like her half sister Paris did last year at the shows. Holly had her first adult day at the show at the Southern Counties. She took the Best of Breed ribbon and received her first CC. In the side categories there was a lot of competition but she did very well for herself coming in 1st in two of the categories and 2nd in the third. She missed her red card day by that one second place. Ironically it was a solid red Persian that kept her from the red card day. What a way to end the 2009 show season. Paris was going for her last Grand Certificate to become a Grand Champion and she won! She made this incredible achievement in 3 straight shows. I must admit I never thought we would have a Grand Champion female before our first male but I was proven wrong. Chief had his first day at a UK show. He won his first CC as well Best of Breed. He'll continue his show career this winter along with Holly. Also at the show was Darius, Yuri and Hana's son, who won his second PC and is now one show win away from achieving his Champion title. Congratulations to all! 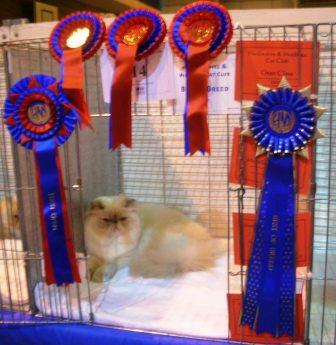 We had our first experience of the National Cat Club Show yesterday. It was a very large show with a lot of Persians. We thought Yuri and Paris were going to have very difficult day with all the competition. Yuri's day out was not as successful as we had hoped. He did not achieve his GC. Paris on the other hand had a terrific day having her second Red Card Day as an adult and that was at The National! The side classes were packed with competition unlike any other show we've been to. She was awarded her second GC Certificate and now we really hopes she gets her 3rd. After debating going for her Grand Champion title we're very glad she's still having wonderful success. Thank you to all the judges on the day! Paris with her Christmas ribbons at The National. Yuri and Paris were out hoping for Grand Certificates. Yuri had another Reserve Day and he's starting to get a complex. He's always a bridesmaid and never the bride. We have our fingers crossed that the next show he finally makes it. Paris on the other hand was awarded her first Grand CC. We certainly weren't expecting this and couldn't have been more proud. She has a real personality at the shows. She always loves a day out even though she dislikes the journey. Yuri had another terrific day out at this show. We received the Grand Reserve so decided that was it for the day. We'll keep trying to Grand him. We decided to have Yuri's picture taken professionally to pass the time away and had just returned to his cage when they began announcing the Best of Variety Awards. First up was BOV Persian Adult and to our complete surprise they called Yuri's pen number. We brought him to the front of the show hall to be judged with all the other beautiful cats. It was very exciting day for us! Also at this show was Yuri's son Brontti Darius (Pishey), a blue colourpoint, being shown by his new owner Anna. They too had a good day at the show. Darius won his first CC Premier and beat a Champion in one of his side classes. He looks just like his father (Thanks Anna for his picture below). Congratulations to Pishey! Paris became our Champion today! We had just her with us at the show which made life a lot easier for us. She won her open class which gained her the title of Champion. She is the first cat to gain this title under our cattery name. We're pleased for her and us of course. She then went on to have a Red Card Day! You just never know how the day is going to go and we're happy the judges liked her this day. Thank you to all the judges over the past couple of weeks that have given her this title. This has been our most challenging show. We decided we would attempt bringing 3 cats. Yuri and his two daughters were the lucky recipients of all our stress. Needless to say the day was well worth it. Yuri received the Grand Challenge Certificate (his 2nd) as well as the BOB for his open class. 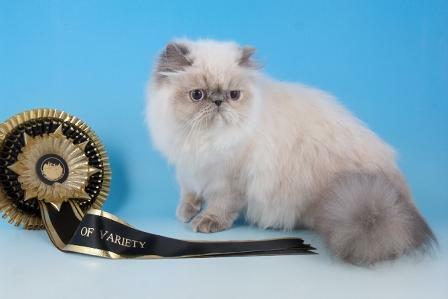 We were even more surprised when we returned home to find out he had also won Best of Varity (BOV) Persian Adult. It was such a busy day that we never had time to find out who won this category. 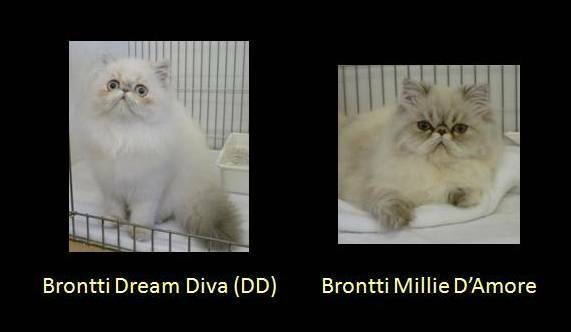 It's quite funny we knew who won BOV Persian Kitten and Neuter but never found out about the adult winner. Some parents we are! It was quite a day for Yuri winning this award as the show was packed with Persians being the last day for qualifications for the Supreme Show. The girls, Paris and Holly both won their open classes. Paris also received her BOB in her class. Side classes were quite tough with all the Persians present. Paris held her own with a 2nd place in each side class. I guess you could say she had bridesmaid day. Paris and Yuri went to the show this past Saturday. It was nice to have father and daughter at the same show. This was Paris's first show as an adult. She won her 1st CC and was also BOB. We're very pleased with the results and hope she makes Champion some day. Yuri was going for his second Grand CC and received the Grand Reserve Certificate. He had a tough category with an incredible show of Persians on the day. We were taken back especially by all the colourpoints in attendance. He'll be with us at the next show in the hopes of achieving his next step on the ladder to Grand Champion. Paris had her second outing at this show still as a kitten. We only went to keep her familiar with going to shows and she ended up having an incredible day. She was awarded the kitten Best of Variety. She had tough competition so we were taken completely by surprise. Thank you to the judge and your wonderful comments. As suspected we kept one of the girls from Yuri & Hana's last litter and her name is Paris. She had her first day out as a kitten and had a Red Card Day! We were so excited for her and for us. She was very relaxed and played most of the day. We're hoping she keeps her attitude and becomes a big star. Yuri continued his winning ways achieving his first Grand Challenge Certificate. We decided we liked showing so we will be bringing him out for a couple of more shows to hopefully get to Grand Champion status. I just wish now we had some other cats or kittens to take along with him. Maybe one from out next litter? Our boy was a star! Much to our surprise he was given Best in Variety. On top of that this was his 3rd CC so he will now be known as Champion Yuri. We're debating whether or not to go for his Grand title. Showing has been a lot of fun and hard work but we have no other cats to show at this time so we'll probably bring him out next year to a couple of shows to see how he does. Meanwhile he's enjoying life as a Champion. Yuri had a terrific day! He had a red card day winning his open class as well as each of his side classes. He was competing against some Champions and a Grand Champion so we were more than chuffed by his performance. We also received some very good comments from the judge saying he has a lovely type and temperament with a beautiful coat. Yeah to Yuri!